What's your name, age and nationality? My name is Jasmine Mann, I'm 27 years old and am from the US - Los Angeles. Are you a full-time digital nomad? Yes I just quit my job about a month ago and decided to build up my own digital marketing agency that focuses on the luxury market. Why did you decide to come to Chiang Mai? It's known to be one of the best spots to meet other digital nomads and also to experience the culture of Thailand besides the typical tourist hotspots. Why did you pick a coliving space instead of a hotel? For the convenience of being able to work right where I am staying because at the end of the day, time is extremely valuable and the convenience gives me extra free time to explore the city. What's been your favorite thing about living and working at Hub53? As I am not familiar with the area, it's a great spot as it's centrally located and I can walk everywhere in Nimman within a few minutes. I also like how friendly everyone is and how Hub53 makes me feel right at home. What are your top 5 things to do in Chiang Mai? 1. Being in the nature and visiting elephants at the 'Elephant Sanctuary' is in my top 5 for sure. Do not miss that! 2. Coffee, coffee & coffee, there are endless unique coffee shops to choose from. Especially the little ones specialized in coffee caught my attention. 3. I loved the free salsa classes at 'One Nimman' - so much fun! And did I mention that they are free??? 4. Being cultural and visiting the many temples here in Chiang Mai, so much history & diversity. My favourite has been 'Doi Suthep'. Zach has been a nomad for the past year and a half and travels for food. He has ventured through much of Southeast Asia and made a few trips to Europe and Latin America. He found out about Hub53 through a facebook post in the Chiang Mai Digital Nomads group. When arranging his return to Chiang Mai, he decided to stay in one of our off-site living accommodations. So far he is thrilled with the apartment, the co-working space, and the ease of getting settled in and back to work. Here's what he had to say about his Hub53 stay and experience. What's your name, age, and nationality? Hey I'm Zach Peirce, 26 years old, and American - please don't hold it against me! Are you a full-time digital nomad, if so, what do you do? Yes, I'm a Product Manager for Fishbowl, a SaaS Marketing Platform used by the restaurant industry. This trip 6 weeks but I spent five months here last year. Chiang Mai is heaven. There is delicious food everywhere and I can drive my motorbike around the mountains on the weekend. I've also made some awesome friends based in Chiang Mai that I wanted to catch up with. What's been your favorite thing about your stay at Hub53? The coworkers have been really cool and welcoming. I know I can come here and count on an awesome internet connection! Why did you pick a coworking space instead of working from coffee shops? What's one thing that cannot be missed in Chiang Mai? Taking a day trip to the 'Sticky waterfalls' and street food. 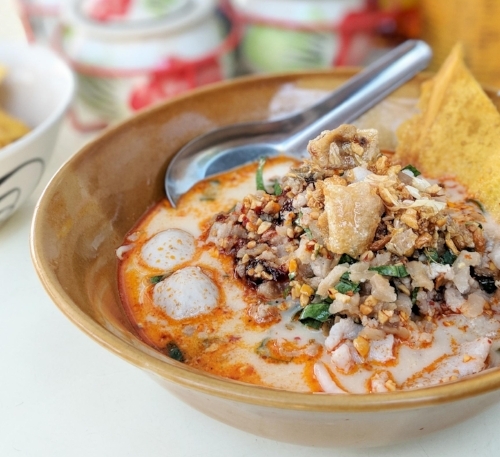 You've mentioned food now a few times, what are your 3 must eat restaurants in Chiang Mai? Nepal for a week of trekking and then I'm off to Bishkek, Kyrgyzstan. How can our readers see more of you? Jeremy recently relocated to Chiang Mai because of the many opportunities to teach and practice meditation that this beautiful city has to offer. At the moment he is creating an online course where people can learn mindfulness techniques for overcoming stress and anxiety in everyday life. My name is Jeremy Lipkowitz, I am 31 years old and originally from the bay area in California. Not yet full time, I still teach mindfulness in person, but I am currently working on creating an online course. I lived in Bangkok for 1 year, teaching mindfulness at an international school. I moved to Chiang Mai at the end of December, so I've been here almost 5 months. I visited last year just for a view days and fell in love with the culture and the food. So what is mindfulness meditation actually and why did you got into it? Mindfulness is a practice of being aware of what is going on in your mind and body and it helps you to connect more with the present moment. It's can be useful for dealing with stress and anxiety, and can help you to feel more calm and balanced. Why did I get into it? Because in school I was often overwhelmed with perfectionism and was anxious almost all of the time. I felt I would never be happy, so I started searching for a solution, which led me to my first book on meditation, and my first silent meditation retreat. The rest is history. Do you have any tips you can give to fellow nomads that are feeling overwhelmed by stress and too much work? * I've found that having a consistent meditation practice, even if it's only one minute a day, really helps me relax and feel more calm. * If you feel overwhelmed at work, you can try this quick mindful breathing practice: close your eyes, take a deep breath, and feel your belly moving in and out. Just do that for 5-10 seconds and I promise you'll feel a little more relaxed. * Regular exercise is one of the best ways to reduce stress. I like to go to the climbing gym, but even going for a brisk walk will help increase your mood. * Science has shown that having a strong and supportive community is one of the best things you can do for your own mental health. You can check out the 'Meditate in Chiang Mai' Facebook group for some meet ups to join. I lead a free meditation group at 'Hidden House Yoga Studio' 4 times a week. * If all else fails, watch some funny cat or baby videos on YouTube. Works every time. What's been your favorite thing about working at Hub53? Why did you pick a coworking space instead of working out of a cafe? I still love cafes, but I realized I wanted a space where I can be more productive. Hub53 is fantastic for getting stuff done. I'm headed to the US in July for a 20-day silent meditation retreat, but I'll be back in Chiang Mai after that. Craig knew he wanted a space where he could focus on building his online fitness coaching company. Somewhere he can relax, focus, and make some good connections with interesting people like himself. That’s how he found himself at Hub53 Coliving and Coworking Space in lovely Chiang Mai! What's your name and occupation? Craig Lewis - Founder of a men's health and fitness company. I wanted somewhere that had a good climate, nice food, but also somewhere I could continue to build my online company. What are your favorite things about this neighborhood? The choices of food and places to drink. The staff and being able to meet so many people from all over the globe. Why did you pick a coliving/coworking space instead of renting an apartment or getting a hotel? I wanted to make use of having a coworking as close as I could to where I was living in order to concentrate on work for a few months. Nomad Coffee Club on Friday afternoons. Back to the UK for a few weeks then somewhere in Europe. There is a stereotype that travel is only for singles and or those who don’t have kids. When it comes to Charly and his family, that stereotype couldn’t be more wrong! 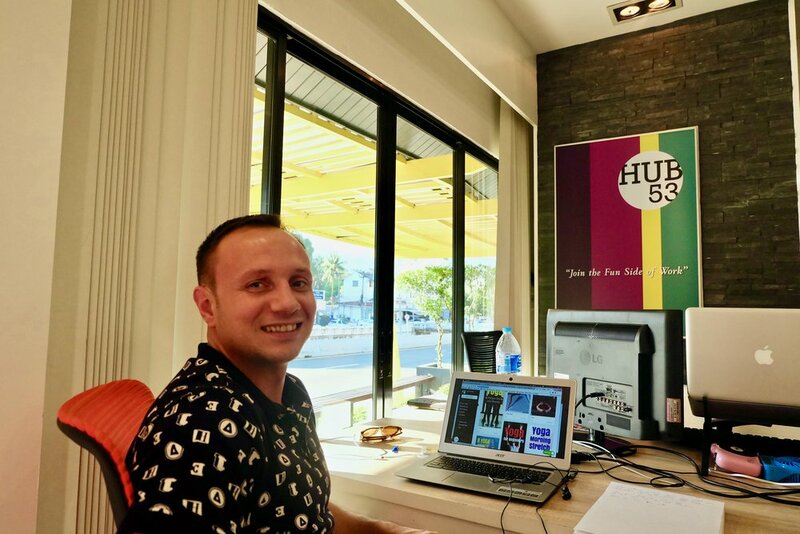 See why Charly, a mobile app developer from Argentina and his wife Korina, a Psychology book author decided that Hub53 Coworking & Coliving would make an ideal home base. Travel on the Brain Founder and Hub53 Coworking and Coliving Space Resident Reveals Her Favorite Chiang Mai Cafes. Recently, we had the pleasure of hosting the vivacious Annemarie Stehl at Hub53. Not only is she great at picking out cute coffee shops, but she is also the Founder and Videographer for the Travel on the Brain blog and YouTube channel. We sat down with her to get the inside scoop on why she loved Chiang Mai and Hub53! Annemarie Strehl, Freelance Creative Director and Video Producer. I heard of its digital nomad scene, affordable dining options and beautiful nature. The cafe scene! How laid back and easy to reach everything is. Plus, you can easily get to doi suthep from here. Meeting awesome people who share a similar lifestyle - no need to explain yourself too much and introduce yourself to new people every day (I travel a lot). I wanted to be able to have my own space but also force myself to not retreat too much. That can easily be a problem with being an introvert. Welcome to Hub53 Coworking & Coliving! Hello, or as we like to say in Thai, "Sawasdee Ka." 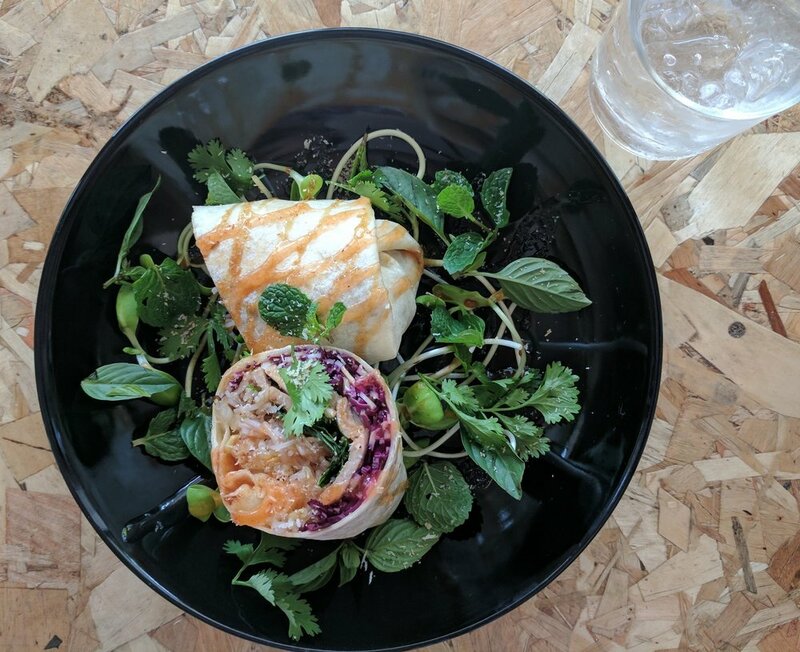 If you are reading this, you are likely considering coming to Chiang Mai, or maybe you are already here, and you are curious about coworking and coliving. We hope that through this blog, you will get an idea of what it is like to stay and work at Hub53. Here, you can meet residents who call Hub53 home. Some are seasoned, location-independent entrepreneurs and some are complete newbies. They all have one thing in common - a desire to live a life that is not ordinary. You will learn why our residents love our neighborhood – located right next to Nimman Road – and get some insider tips on our favorite cafes, local events, and digital nomad meet ups!